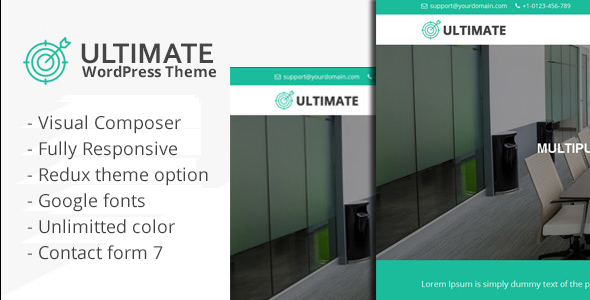 Ultimate Multiple is a professional multiple purpose responsive WordPress theme coded with Bootstrap framework. Ultimate comes with a creative design layouts which is suitable for corporate sites, learning management system sites, university, school, primary school, business and similar websites. We build single blog pages, grid, table lists. We built this theme on Visual Composer, a very convenient drag-n-drop PageBuilder for WordPress. It should provide you with the smoothest experience while creating your website with our theme. The WordPress theme is responsive, you can view it also in the mobile/tablets devices and it looks very in more devices. Compatible with WPML, Bootstrap 3.x. Ultimate Multiple Purpose WordPress Theme has been tested with browsers IE10, IE11, Firefox, Safari, Opera, Chrome.